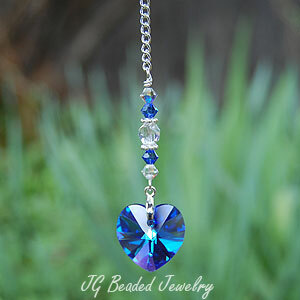 A unique wire wrapped clear quartz crystal rearview mirror protection crystal that is double terminated (has points on top and bottom) and embellished with clear quartz rounds, beautiful opalite (also called sea opal) and beautiful silver etched metal beads. 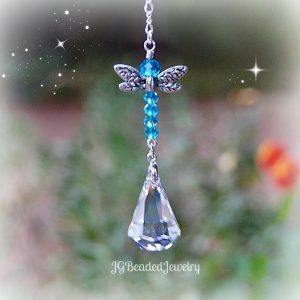 These wire wrapped quartz crystal pendulums comes on a silver chain with clasp for ease of hanging on the rearview, or a 6″ chain with ring to hang from a hook wherever you choose! 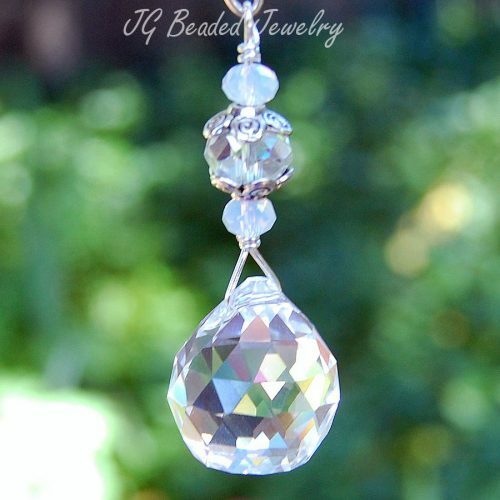 ♥ Clear quartz is the most powerful healing stone, protection stone, and is believed to protect against negative energy.